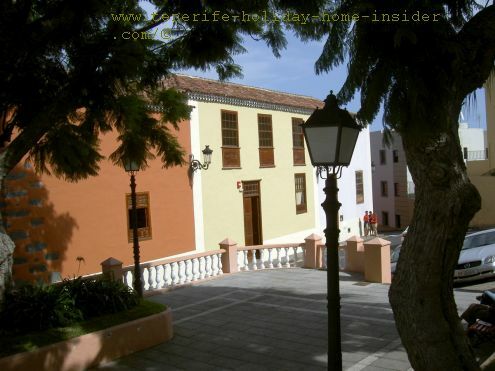 The former Royal Finca Tenerife Hacienda de los Principes and what meets the eye.. 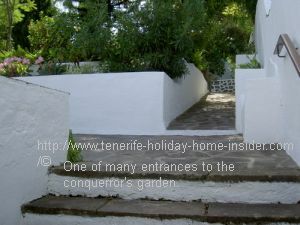 Indeed, the Finca Tenerife was also the first Hacienda on the biggest Canary Island in 1496 . It has been a jewel of a BIC monument of cultural interest since 2007. However, most of its architecture dates back to the seventeenth and eighteenth centur. Hacienda de Los Principes in Realejos. This name derives from a marriage with a prince of Asculi of a niece of the first owner the Adelantado Alonso Fernández de Lugo the conqueror of Tenerife. 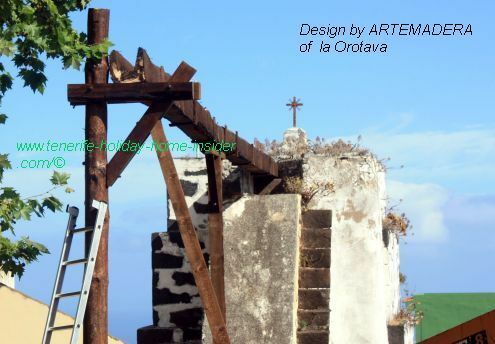 The Adelantado the conqueror of Tenerife built its forerunner on a Plateau between the gorges Barranco Godinez and Barranco de la Azadilla. He had views of mountains and ocean. He used much of the 166200 square meters of the very vertile land that had belonged to the Guanches to plant sugar cane. Prime water came from the nearby slopes of Tigaiga. Slopes of Tigaiga by the bridge and monument of El Lance by the old Camino Real the King's Highway. There at Lance, Bentor the last king of the Guanches commited suicide and jumped into the abyss. He was also Mencey of Taoro today's Orotava Valley. Calle Los Molinos a road sign is still proof that there was more than one mill called Molino on Hacienda de Los Principes. 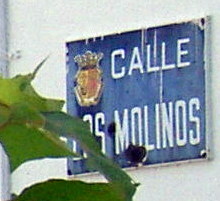 Calle Acequias runs parallel to Calle Los Molinos of the mills with its royal coat of arms. Both streets give tribute to the water in this location. Mind that it was truly abundant for more than the farm of the 16 hectares. Initially, there was only a wooden aqueduct between the so called Parra Alta and Parra Baja. Both were important resources of the prime farmsteadt the Finca of the Adelantado. Section of a wooden aqueduct which was later copied to transport water in Calle Los Molinos of La Orotava. In 1512, the conqueror turned his property into a "Mayorazgo" which could only be inherited but not sold until its abolition in 1841. Banana plantations followed suite. 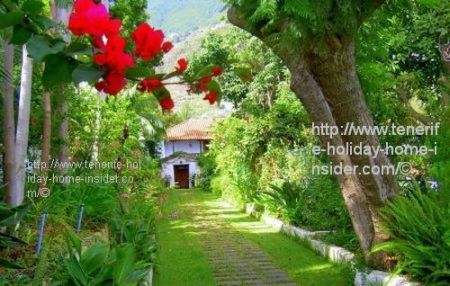 Check out this Santiago del Teide feudal estate of Mayorazgoes by a typical Hacienda of the era with a Lagar wine press and more. Hacienda de Los Principes Garden of the most important and first Finca Tenerife that was copied by all big landowners right down to its vineyards with wine processing, its Lagares, its water as well as its Gofio mills. Not to forget the timber aqueducts. Depicted above is the lush beauty of this subtropical Hacienda oasis, as it remained until now on the bottom of Calle Los Molinos. This former farm is in lower Realejo which was an independent town until 1952 but is today a suburb of Los Realejos. Together with Finca Tenerife it's a relic from way back of the century XV. Architectural details and more that meets the eye. A side portal to let through horse carriages. A wooden gate that leads to the Parra Alta with its paradise garden behind it. Finca Tenerife Hacienda de los Principes chapel. Initially, the chapel stood last by the convent San Sebastian for nuns at San Agustin. 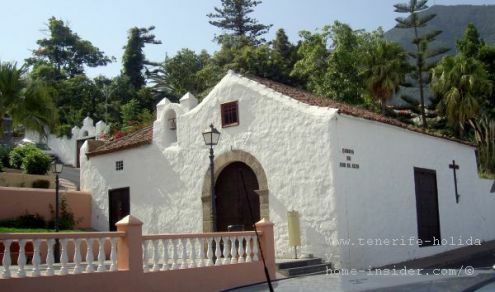 Plaza de la Parra of the Finca Tenerife Hacienda de Los Principes. 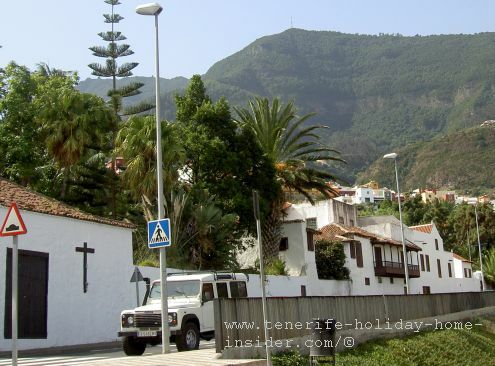 t Walk down the road by a group of people and reach the church square of Iglesia de la Concepcion within two minutes. The adjoining Plaza de La Parra has magnificent, old shade trees where people may rest on benches underneath. Not to forget are public Titsa bus stops nearby. Rustic entrance steps lead up to a garden on a higher level. Lilac lilies are flowering there. The section seems to be part of a well groomed small park whose adjoining building was up for rent. This was at the end of October 2011 for 200 m2 of luxury accommodation of the Finca de los Principes which included gardens. 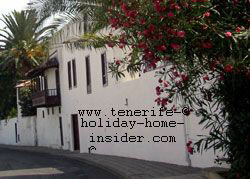 It was not for Tenerife holiday home accommodation. A good part seems to have been lovingly restored to judge by the interior photos which were in the Internet. Indeed, the asking price was justified.